"What Could Have Been, What Can Still Be, And What Is"
Vandal Savage is soaring into space closing in on the comet that he has been plotting to absorb for centuries with Superman giving pouring on the speed in hot pursuit. The two fight it out but Vandal grows more powerful every inch he gets closer to the comet. With sudden intensity Vandal erupts into a purple flame, literally burning up with power. With one punch Savage sends Superman hurtling back to earth and then stands over his foe. Vandal expresses his disappointment in Clark for having the gift of strength but instead of reveling in it he uses his power to become a servant to those beneath him. With great power comes great responsibility and Vandal decides to use his power to show Clark that consequences. Everything fades to black. Suddenly Clark wakes up in his baby rocketship, it is unfinished and when the makers, his young parents, arrive he realizes he is back on Krypton in its past. A quake threatens to bring the rook down on the El home and Superman races forward to save them. As he dusts himself off he meets a young version of himself, something perplexing as he was never on Krypton as a youth. When young Kal uses the work Rao, Lara scolds him about it. There is no Rao, there is only the High Chief. The El's surmise that the High Chief must have sent him to save them, but Clark points out he came from the rocket. Jor-El shrugs it off, he had planned to send baby Kal fearing Krypton would explode but once Lara convinced him the High Chief would stabilize the planet he realized it was just his lack of faith. Alarm bells ring in Clark's head and he asks the young El's where to find this all powerful savior. Clark, powerless on Krypton forces his way into a tower to meet the Chief and demands to know what is going on. Vandal reveals he is using his power to heal the planet but Clark isn't buying into the fantasy and demands the truth. Savage then tells him that, Puzzler, whom he gifted with the power of absorption, had been able to merge with some of Hordr_Root and gained the ability to create virtual simulations. 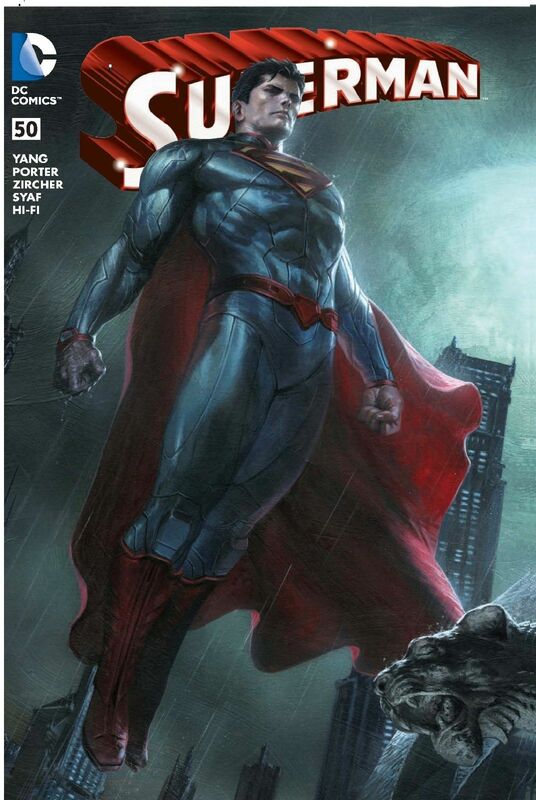 Now in the distant future Superman is a General, the advisor to Earth's ruler High Chief. Dominators threaten their future empire and Clark is shocked to see that the Special Forces team are twisted versions of Captain Atom, Gorilla Grodd, Killer Croc, Black Adam, Shazam, Blockbuster, Lobo, Giganta and Aquaman. He wonders if they are captives in the simulation or constructs like his parents. Unwilling to take a chance Clark participates in the fight and the team wins. The feeling of justice feels good to Clark and Vandal offers to make this scenario a reality. Clark asks what will happen to the weak and Vandal informs him that they don't matter. Because the weak fear him, they convince him he needs to be subservient to their weaknesses. Strength that serves weakness will not remain so he tells Clark, but the man of steel brushes off the argument to convince him with a valid point, if Savage now has ultimate power why would he even need Superman now? This one is total destruction, everyone and everything is dead save for Vandal and Clark. Weakness leads to failure, to pain, if Clark joins him this future will never be. If Clark is determined to be attached to the weak, they will still benefit from the creation of the strongest clan. The simulation halts and Clark is standing in front of Puzzler and Vandal and while Clark stutters through the revelations Vandal takes Puzzler to try and bring the comet down to earth. News crews arrive and he thinks over the simulations; the El's could have been alive, Lois, Jimmy and other innocents could die if he fails. What could have been, what could be, but the phrase 'Choices have consequences' makes Clark remember what is and his mind wanders to a life lesson from Jonathan Kent. In the memory young tells his dad that a boy at school is bullying him and the other smaller weaker kids. Jonathan asks him if he's tried to reason with the bully, but Clark tells him that violence is the answer. When Jonathan points out that it isn't the answer to all problems, there are always other solutions and it is all in the choices you make. Our choices make us who we are and he is definitely not someone that believes in strength above all else. With his dad's life lesson ringing in his ears he launches himself into the sky. With Vandal and Puzzler pushing the comet down to earth, Clark musters all his strength to force it away. When Vandal realizes Clark has chosen not to join him he instructs Puzzler to finish off Superman. Puzzler does approach Superman but he witnessed the mercy shown by Clark to Hordr and the simulations Savage created and decides to ask Superman why Clark didn't kill Hordr when he had the chance. Superman tells Puzzler that despite him no longer having a human body, Hordr was still a person capable of decisions and choices that's why he couldn't kill Hordr. He then reaches out to Puzzler, who is now also in Hordr's predicament after his body was also destroyed. With all his family now dead is he destined to always be a resource for Vandal or a person capable of being more? It works and Puzzler decides to help Superman push the comet away. Vandal angrily pours on more strength and speed vowing revenge but the two opposing forced cause the comet to explode. Vandal is thrown into deep space by the impact while Puzzler and Superman hurtle to the earth below. Lois and Jimmy help up Clark and though its unsaid, Lois and Clark forgive one another with a hug. Later, in a diner, Jimmy and Lois show Clark the photo of him repowered. Jimmy is officially back at The Daily Planet. A call for help alerts Clark to an emergency and he races away. 'Go be Superman!' Jimmy tells him. But Lois says 'Go be Clark' and with that Superman soars into the sky. Story - 3: While interesting to bring in a riff on 'A Christmas Carol' as a plot device in Truth, it really doesn't fit in the ending. There is just no need for it, and considering the point in the finale that it is being used, it feels out of place. This issue follows Superman/Wonder Woman #27 all the heroes were held back fighting off Vandal's children while Superman pursued Savage. Here's the thing... all the children died - they exploded. So then we have the world's heroes all standing over charred remains while Superman fights and uberpowered Vandal Savage. The two return to earth and then two-thirds of the book are dreams. Then the finale with the comet exploding and all that jazz happens but where did all the heroes go? They aren't even referenced, they just vanish and leave Clark to face a foe that has been tormenting Clark and holding many of them captive or torturing them? Okay. Even Diana? Okay. The life lesson angle is just lost in the swamp of simulations and Clark would honestly not have been taken in by this nor even considered anything Vandal offered. 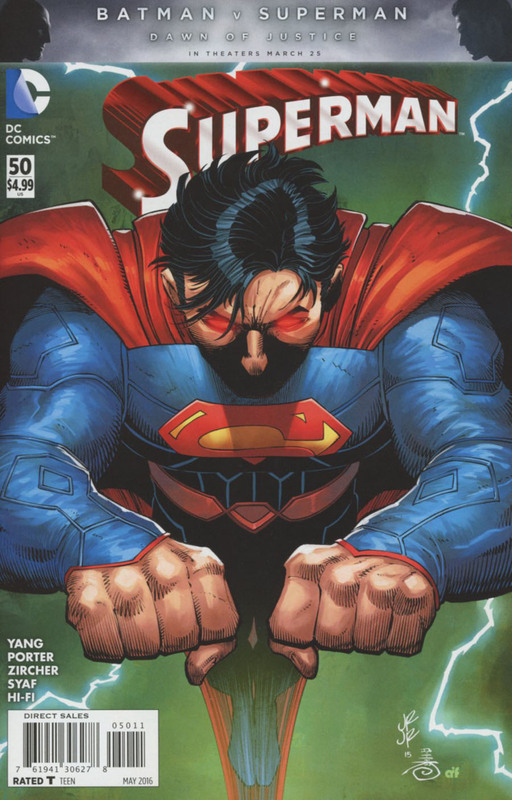 I liked the scene with Jonathan Kent but the angle on strength is repeated over and over this issue to the point where I think that Yang was the one struggling with it, not Superman. Puzzler switching sides is beyond cheesy, he was gung ho for ending Superman, even vindictive, when he tried to kill Clark in the Argus facility. If they wanted to make more of his loss of a body and his reluctance they should have done so before now but the problem with his last second switch is he reveled in killing and doing the bidding of his father. Even activating the virtual simulation was voluntary so to emulate Johnny Five as a deux ex machina was cheesier than cheddar. The Lois 'fix' though welcome is too fast. Too much has happened and though they've made headway during the Metallo sacrifice, to hug it out is NOT how Lois & Clark need to make peace. They need to have a heart to heart not just utter "Me Too" and all is back to normal and forgiven. I'm sure this will anger some camps but this was not enough of a resolution for me. Reading this issue makes me think they started the arc with absolutely no idea how they were ever going to finish it. I liked when Yang began writing in the current time rather than its prequel as the story picked up pace. The cast were frequently written out of character and there was that whole underground wrestling arc. They seemingly wrote themselves into a corner with no way out. I'm giving it a 3 only because it is the end. The end. Rejoice. There were high points, not many, there were low points, too many. Art - 5: The mixing of artists is usually something that is a gripe with me but it works within the framework of the virtual simulations. Porter, Zircher and Siaf continue to leave me in awe and to have Bogdanove doing some art is the icing on the cake. Fantastic stuff. Cover Art - 1: I just hate it. No effort at all here. You want a determined Superman? Flick through the interior pages. That panel with Clark chasing Vandal in space - that's Superman, this is just a 'phone in' cover. "Batman v Superman" Variant Cover Art #1 - 4: I like seeing the three stages the fully rendered one is exploding with energy and though a little cartoony promises an epic battle! "Batman v Superman" Variant Cover Art #2 - 4: I like it, has a classic Curt Swan esque vibe to it. Compared to the other too 'rage' orientated covers this is a welcome variant.